Hi, this is Sandra and I'm here to share a solution to an age-old question. What do you do with your Origami projects? It's Origami! It's a Double Whammy! It's an Amazing Mold Putty Piece! Yes! It's a Dollar Tree find and more! 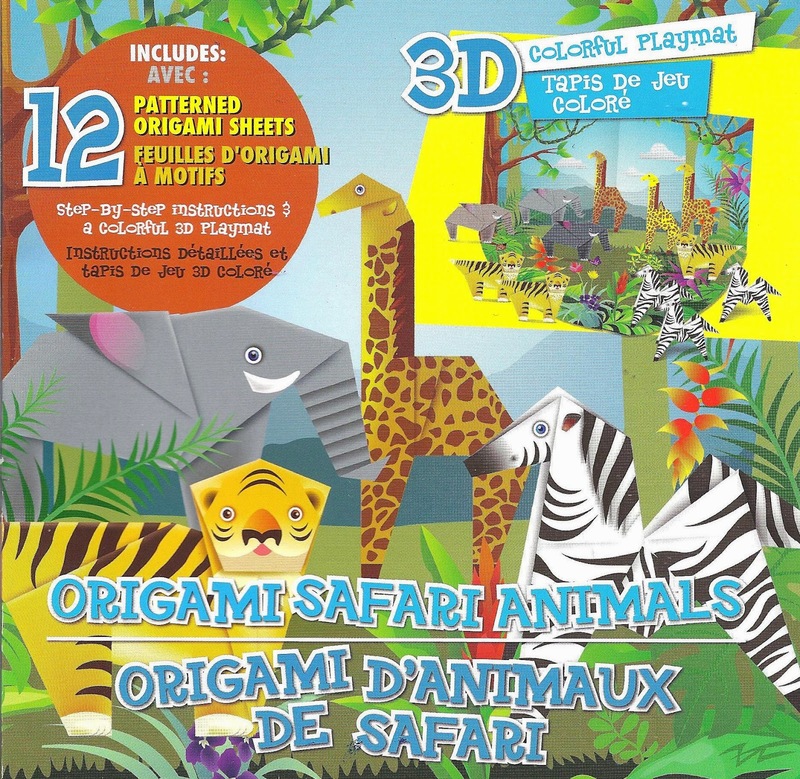 As I was strolling through Dollar Tree one day, I happened to see a fun little package of Origami Safari Animals. I like Origami. The problem is, what do you do with all those flimsy little pieces of paper after you've folded them? And what if you really want to keep one forever. How do you protect it? I came up with a couple of ideas. One I'm sharing with you today, and the other will be for another day. So where to go from here? Let's start with a mold! I decided I wanted to mold an origami cat. 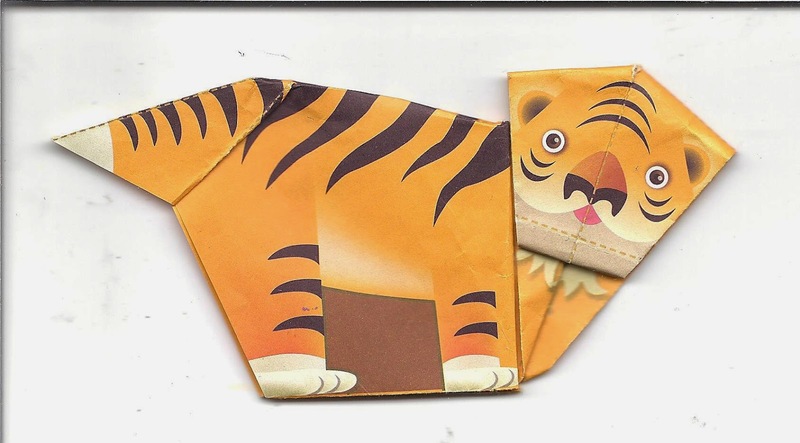 I know the picture shows a tiger, and in fact that's what I folded. I followed the instructions in the packet (I found this video that shows how it is done). But, push come to shove, without the painted paper, it's an origami cat. Having molded it, I can now cast and paint a resin cat to use for journal pages, canvases and any item that would just look so much better with a cat on it. Having folded the cat, the first step was to prepare the piece for molding. Normally, you don't cut or glue origami, but it's necessary for molding. 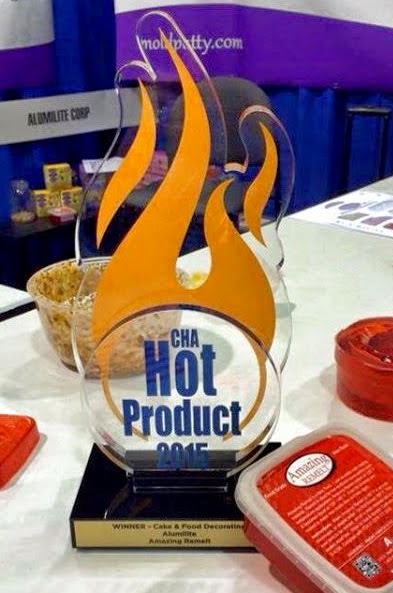 You don't want any nooks or crannies where the mold putty might get caught or tear. I also added glue in a few places to help hold the shape. Under the tiger's face and along his back. The dried glue kept the paper from being flattened out of shape during the molding process. I also cut away the brown section between the feet and the wedge under the chin, so my piece would have more cat shape. ... and then you moosh the two balls together, working quickly, until the whole thing is yellow and any streaks, lines or cracks are gone. You have about 5-10 minutes before it sets, depending on the humidity and temperature. I lay the origami tiger face up, and flattened the mold putty around it. Once set I flipped it over and pulled the tiger out. You could also flatten the putty first and then push the tiger into it, but you are more likely to get an even molding doing it the way I did it. I decided to go with Amazing Clear Cast Resin rather than the Amazing Casting Resin, that cures white, for two important reasons. With the Clear Cast Resin you can see some of the background behind your piece. I had a vision of my cat on a journal page with text showing through. My second reason was even more important. I couldn't find my bottles of Amazing Casting Resin. I did later, LOL (In my own defense, I've been doing some remodeling and moving things around). Having decided that my tiger cat was going to become a leopard, I used a small brush to dust the mold with dots of Pewter Alumidust. Then I brushed Orange Alumidust over the entire molding area. I did the Pewter first, because the first color down is the color that will show. It takes a little work to make the colors blend, so I didn't need to worry about keeping them separate. I just brushed orange everywhere including over the dots. I used the measuring cups that come with both kinds of resin. They are labeled with measurements in TBS, OZ, DRAMs, CCs and MLs. You need two cups, so whichever measurement you use, make sure both are turned where you are reading the same measurement. And see those gloves? You'll be much happier if you wear gloves during this part of the process. Like the putty, the Amazing Clear Cast Resin comes in two parts, "A" and "B". Part "A" is thicker, and takes a few moments to settle. You'll want equal amounts, so pour Part "A" first, let it settle, and then pour the same amount of Part "B". Another tip -- only open the bottle from which you are pouring and recap it before you open the other bottle. The resin sets after you mix the two parts. If you accidentally put the wrong cap on the wrong bottle, it could mix and seal and then you'll never get the bottle open again. Once you've poured the Amazing Clear Cast Resin, let it sit for a few minutes so bubbles can pop, then pour both parts together in a third container. Use the popsicle stick from the box to stir them together-slowly-until all the swirls are gone. You stir slowly to help prevent bubbles, but you'll get some anyway. Let the mix sit for another few minutes and then pour it into the mold. The length of time for the resin to cure depends on the temperature and humidity. It took about 12 hours this time, but could take up to 24. When it comes out the piece looks like this. I didn't like the chin whiskers so I trimmed them off. Then I used Indigo Acrylic paint to darken the dots. I colored over and slightly to the side of the pewter dots, so the pewter seems like a shadow, adding some depth that doesn't show in the photos. I used the same color for the facial features, outlining the eyes, nose and mouth. The other colors were all for the eyes, making them yellow with gold shadows and white highlights. About the time I started working on this project, my sister-in-law sent me this burl from a tree in her home in North Carolina. I thought it was cool, and decided to turn my origami resin piece into a desk decoration instead of a journal embellishment. While the resin was still soft enough to twist the piece a little bit, I found a placement where the leopard's paws would fit into the folds of the burl, glued him in, and now he's standing beside my PC! 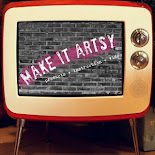 For more complete instructions in molding or casting, please check out the Amazing Crafting Products Video Library. 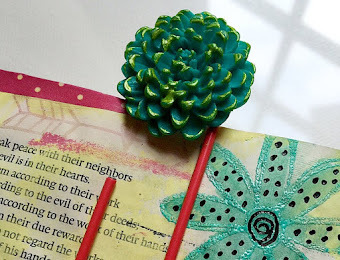 For more of my work in Amazing Mold Putty, zentangle-inspired art, and daily links to tangles, tutorials, and giveaways please visit my "Life Imitates Doodles" blog. Join us each Monday for Mold Rubber Mondays – where we will share projects and inspiration using this fabulous product available at Amazing Crafting Products! 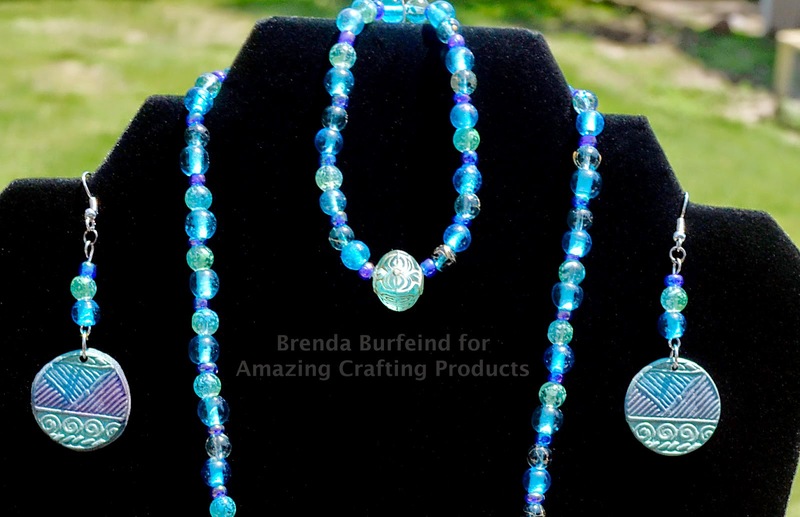 Good day, Brenda here again to hopefully inspire you to make something. 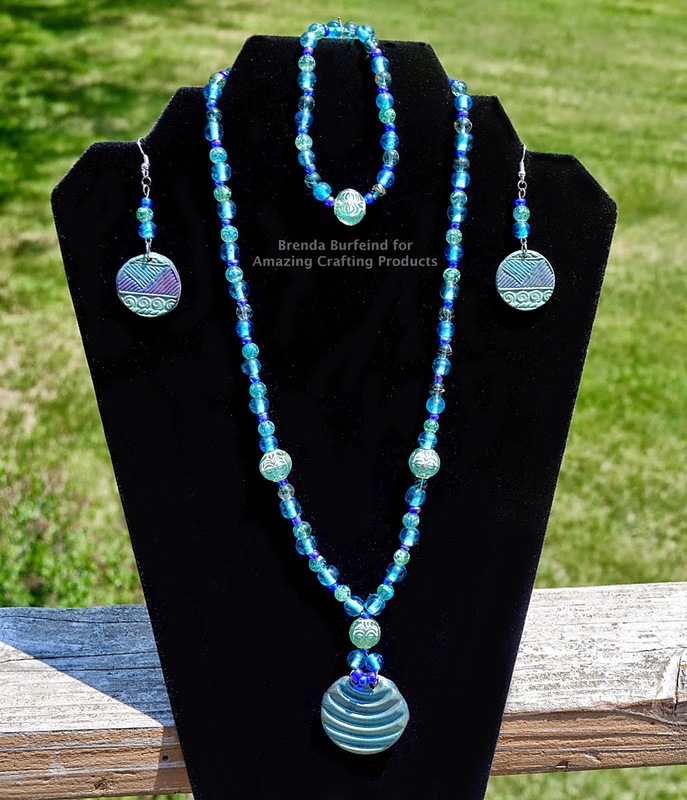 I love making jewelry and today I am here to show you a simple jewelry project that was inspired by my trip to Florida. A few months back I took my vacation in Florida and I got to meet our fabulous leader Susan. She traveled up meet me in Daytona Beach and we spent one whole day junk-ing. I had such a great time with her and we found some awesome trinkets. Today I will show you two of those fabulous finds. Here are a couple of buttons I found and just loved the detail. 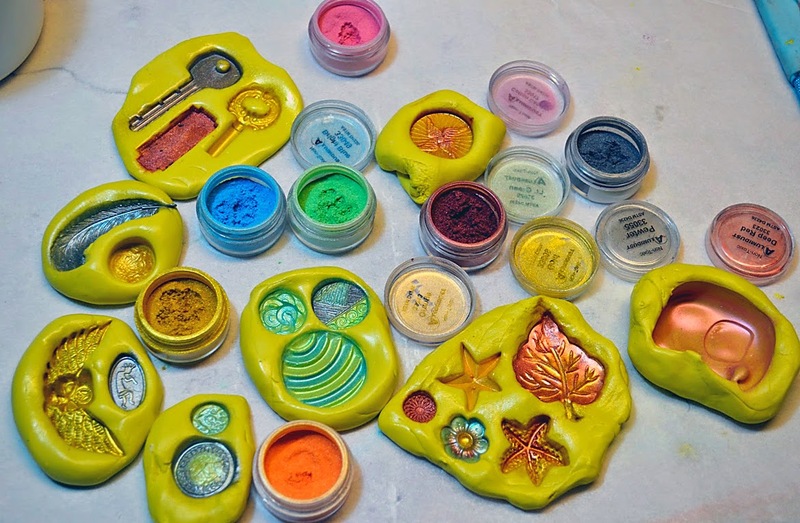 Using the Alumidust, I "painted" all of my molds created with Amazing Mold Putty. All of these items were found while I was in Florida. I decided to go with a green/blue with a bit of purple to remember my days in Florida. The beaches and the ocean water were fabulous. Just look at the sparkle... love it! over the top of all my molds. So messy, but so much fun! don't go together? I even added a little bit of purple. the perfect ones to go with my new recasted buttons. create with your button stash? I love comments, so please tell me what you would create! Hi hi hi friends! DeeDee here today, it's been a while but I'm excited to be back on the Amazing Crafting Products blog sharing some of my works with you. Today I'm doing a start to finish photo tutorial in a super FALL HARVEST theme. I'm so pumped for September right around the corner, and can't wait for the weather here in Vegas to relax just a little bit more. Let's get started shall we? 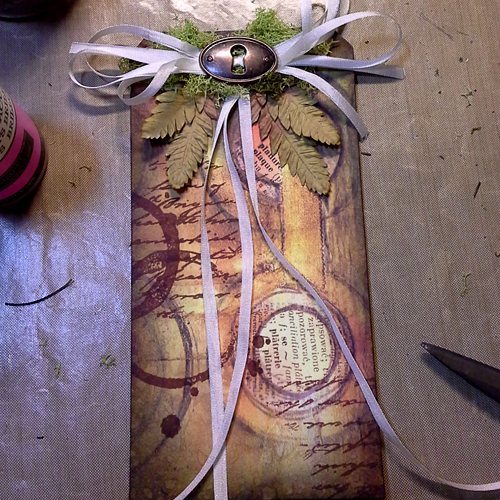 Finnabair cut using a Sizzix / Tim Holtz die. 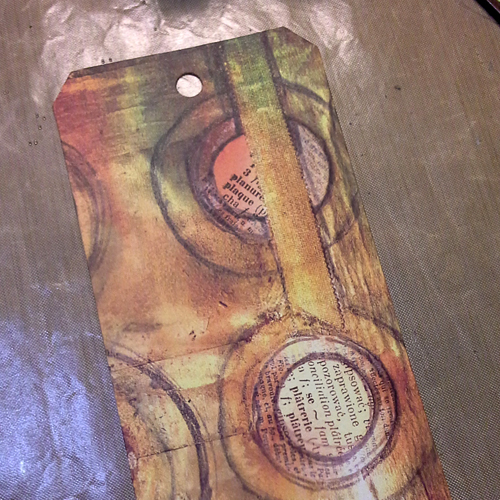 2) Distress edges with Walnut Stain Distress Ink and water. 3) Mix equal parts of Amazing Mold Putty parts "A" and "B". 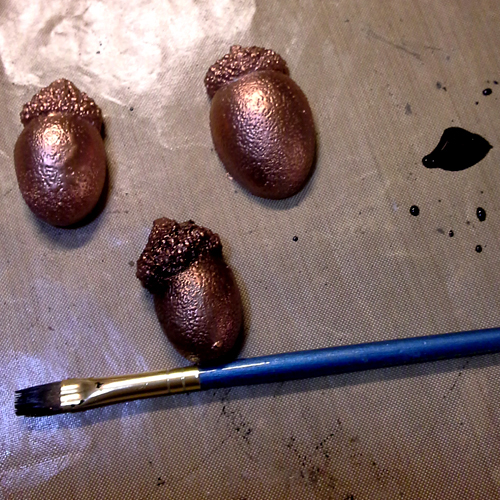 4) Form Amazing Mold Putty around acorns. or project that I'm working on. SO I only mold half way around the piece. 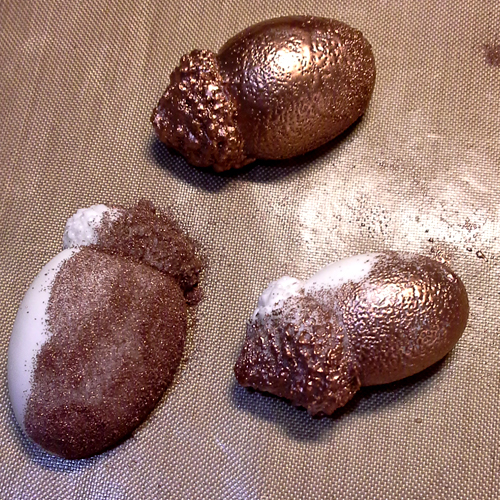 5) Mix equal parts of Amazing Casting Resin and pour acorns. 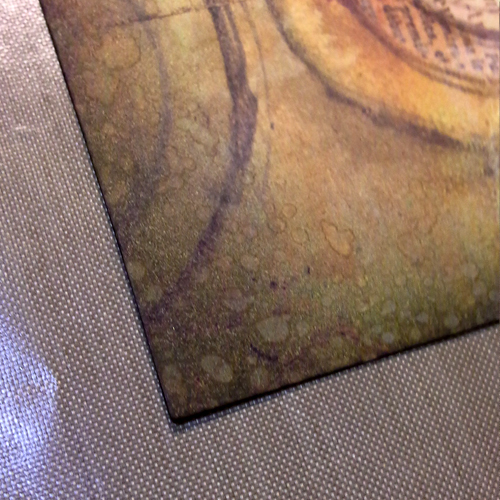 them with some WOW copper embossing powder. because I don't need to worry about altering my mold or changing the original piece. 8) Distress with black acrylic paint. 9) Finish by layering the acorns up and adhering a sentiment. glass beads, adhesives, powders, flocking, inks, mists, paints, more resin! 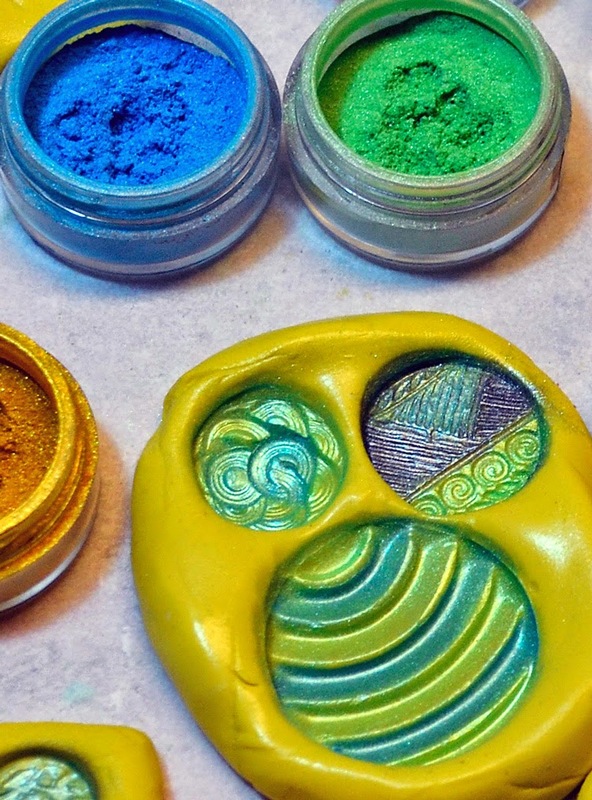 Save yourself a little money by making your own souvenirs! 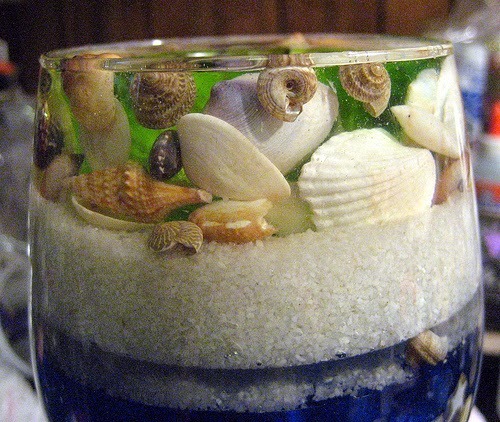 Take all those shells your kids have collected and make a lasting souvenir of your vacation. 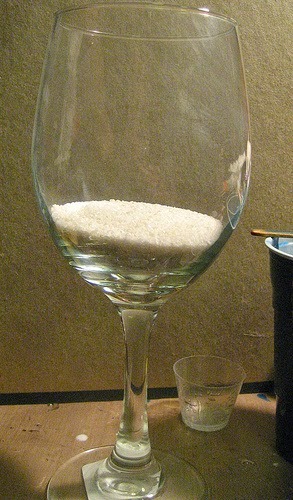 Pour sand in the wine glass. This is going to replicate the ocean. 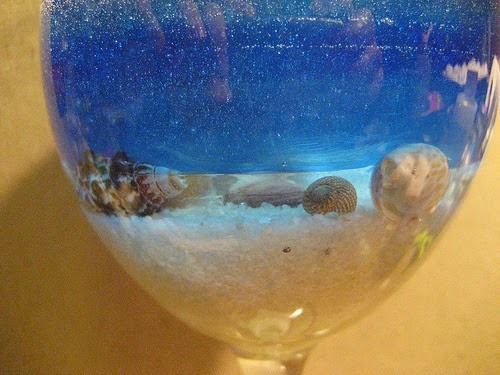 This is the sand on the bottom of the sea, so fill it about 1/6th up. 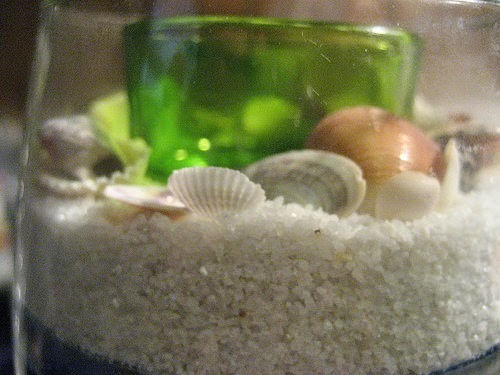 Drop some shells on top of the sand, stick close to the outside edge of the glass (you won't be able to see the shells in the middle very well, so don't waste them). Mix up some Amazing Clear Cast Resin (clear) and slowly pour in wine glass. Avoid the side of the glass, you don't want clear drips down your glass. The resin will slowly soak into all the sand. You may see air bubbles. Let cure. It took about 3 hours for my clear resin to cure enough to move to the next step. 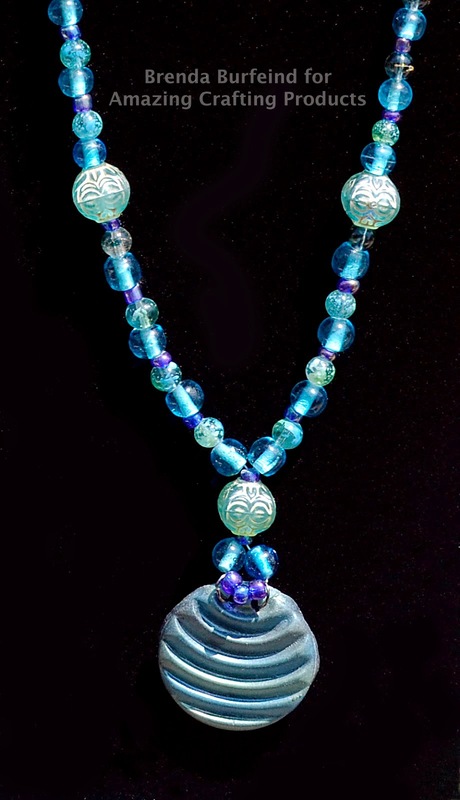 Using the Alumilite Blue Dye, mix a small amount into part "A" of your Amazing Clear Cast Resin. You want just a small amount!!! I made the mistake of thinking it would cure more transparent the first time and it did not! Start light – you can always make it darker. Let this cure over night. Add a layer of Amazing Clear Cast Resin on top of the blue layer. You can throw in a shell or two if you like. I dropped a little sand on the top after it had cured a little while. 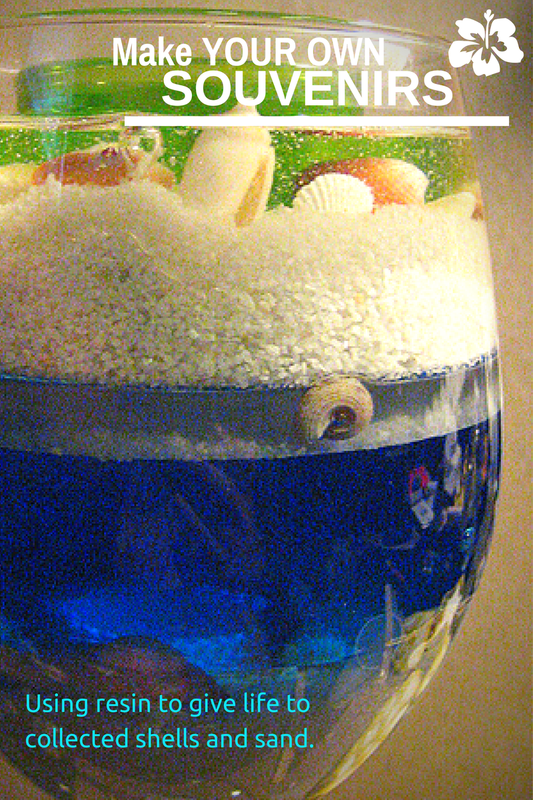 I decided to do this clear layer before I added more sand because on a test glass, the sand actually fell all the way through the blue in a few spots. 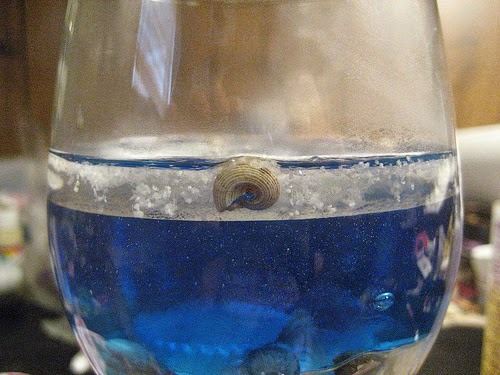 The clear layer will seal the blue water layer and keep it separate from the sand. What Will You SAVE now? 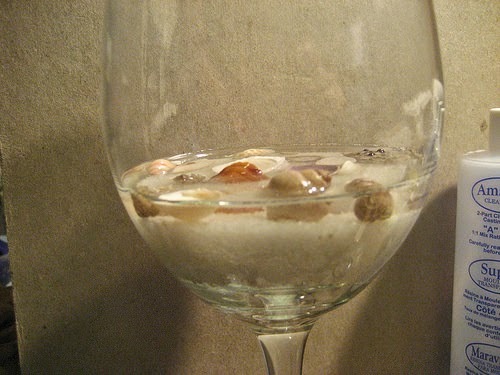 Now add some more sand and position your glass votive in the center. You can start arranging more shells. After you have the shells arranged you can add more Amazing Clear Cast Resin. I let the resin cure for a few hours then added more shells and more resin. I love how it looks! You may see air bubbles coming up from the sand and need to add more Amazing Clear Cast Resin as it starts to soak into the sand. 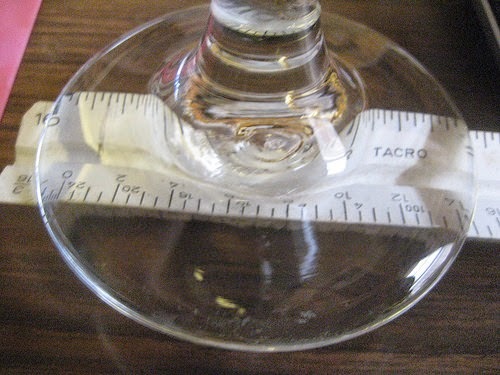 Measure the bottom of your glass so you can use a computer to layout text. 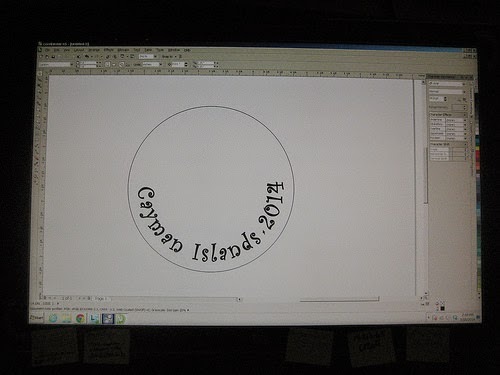 I used CorelDRAW – but you can use any software that lets your curve text. 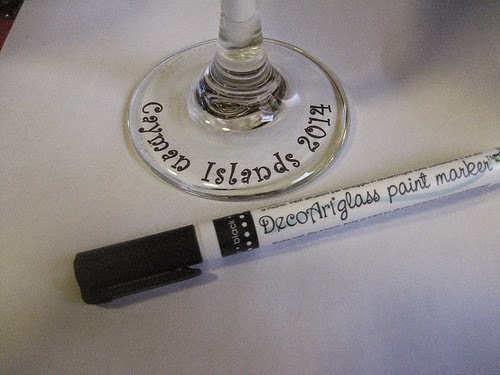 Print it out and place glass under the print out and trace with a glass marker. Now light your candle and reflect on your vacation. With all the money you saved on souvenirs you have a jump start paying for the next trip! Think about how much grandma would love a gift like this made from shells her grand kids collected. This is much better than a "I went to the Caymans and all i got was this lousy t-shirt" shirt!!! 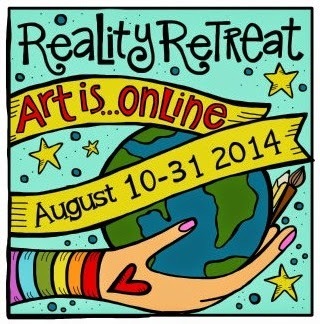 Hello Amazing Creatives! 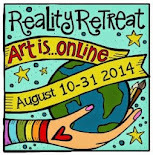 We would like to welcome all of our new friends from the Art is You Reality Retreat and give a little info about AMAZING Mold Rubber with a showcase via inLinkz of all of our projects using this AMAZING product. 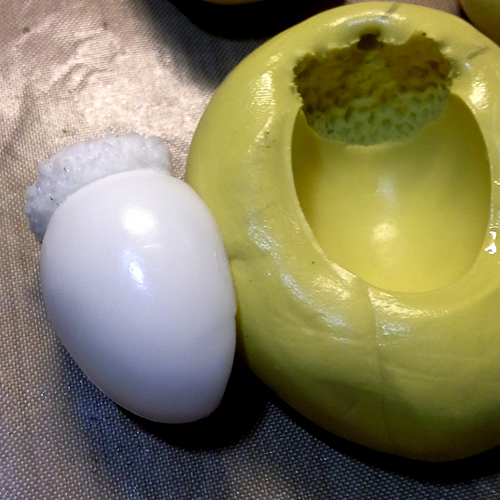 Last Summer, Amazing Crafting Products introduced a new product – AMAZING Mold Rubber. 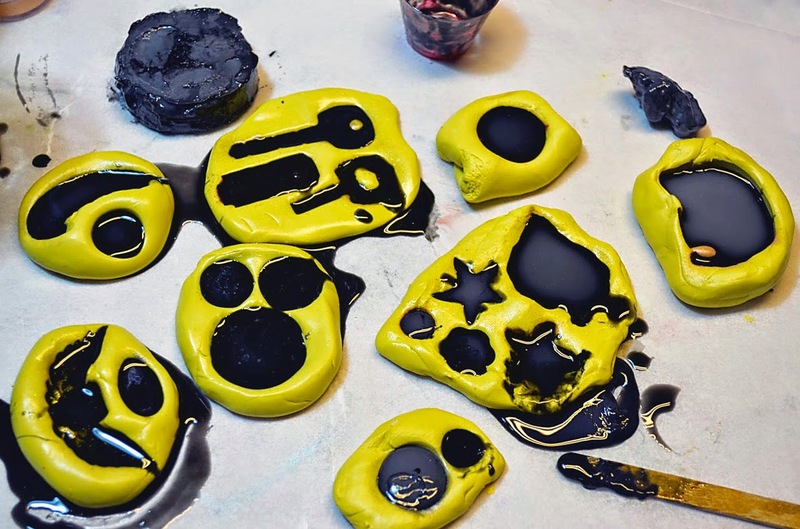 And Since it's debut here last summer - we declared that all Mondays on the Amazing Mold Putty Blog will be Mold Rubber Monday – dedicated to projects and inspiration using this fabulous product. Amazing Mold Rubber is an easy to use, high strength liquid silicone mold making rubber that is strong, soft and flexible - great for undercut parts. Please note: this product is NOT FOOD-SAFE. Amazing Mold Rubber is a two-part liquid rubber used to make extremely elastic molds to produce quick and exact reproductions of your original. Replicas can then be cast in Amazing Casting Resin, Amazing Clear Cast Resin for plastic parts - or use other materials such as plaster, wax, clay or polyester. 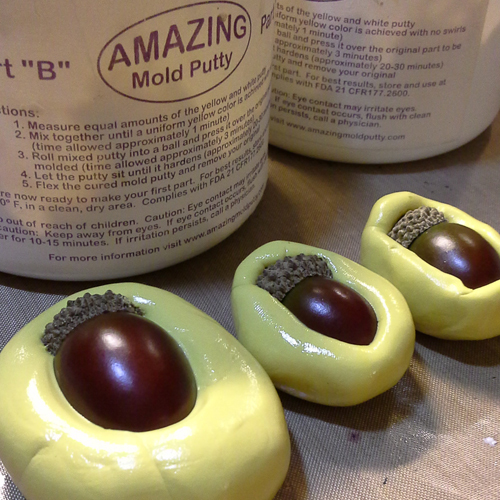 Amazing Mold Rubber is available at Michaels and Hobby Lobby Stores and the Amazing Crafting Products website. We have compiled all the #MoldRubberMonday posts from the Amazing Mold Putty Blog vault for your reading pleasure. Please click on the photos blocks below to jump to the project post. this post for future reference. Join us next week for another MOLD RUBBER Monday!